Saturday 27th February, with brilliant sunshine, saw the official naming of our choir hall as 'The Robert Wilson Hall' by Maureen Wilson and Lady Sylvia Hermon MP. This marks the distinguished service by Robert Wilson MBE who gave so much over 47 years to Donaghadee Male Voice Choir and many more with his special music abilities taking the choir to many countries and great successes. The conductor's baton has been taken up by Ivan Black, a very great friend of Robert's and the choir, so we enter a new era to continue singing in many locations with friends made over the years. There will be a memorial concert in the Ulster Hall, Belfast on Saturday 1st October 2016 with all proceeds going to charity. This will include many friends and artists who knew Robert and the choir over many years. Full details will be posted on our website in due course. “ Words can’t convey the truly incredible difference you’ve made to families this year. From earthquakes, floods, typhoons and conflict - you’ve given shelter and warmth to more than 28, 000 people in their darkest hours. 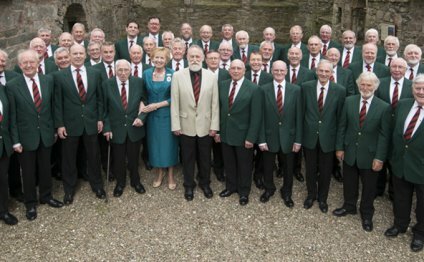 Your ShelterBox aid, in the name of Donaghadee Male Voice Choir, will be delivered to families in desperate need. Your generosity and support means we can be there for families this Christmas, supplying solar lamps, cooking sets and thermal blankets. Thanks to you we can pack tents with special walls to prevent heat loss as well as insulated sleeping mats that can be filled with straw, keeping families safe and warm.